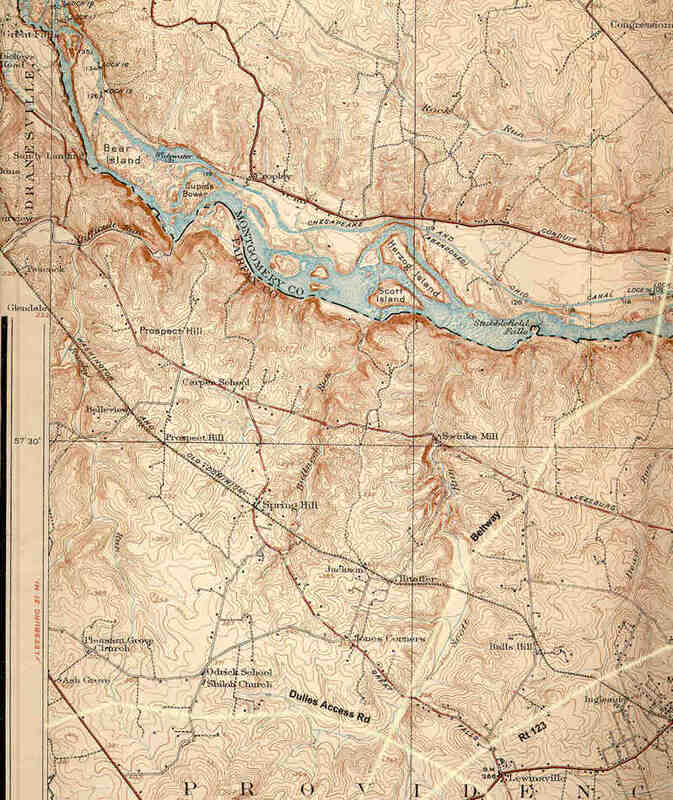 The above map was taken from a portion of a Washington area topo map produced sometime in the 1920s. The Beltway, Dulles Access Road, and Route 123 are drawn in to help get your bearings. A trolley line ran over the Washington & Old Dominion Railroad spur from Washington to Great Falls. An amusement park at Great Falls served to attract many riders. Service on the spur started in 1906 and was terminated in 1934. The right of way was sold to Fairfax and Arlington Counties for outstanding taxes. The road known as Old Dominion Drive now follows the route of the tracks. The old area map of Washington was drawn beyond the map border to include what is now called Great Falls Park. Notice that the automobile entrance to the park appears to follow part of the alignment of what is now known as the Old Carraige Road. Great Falls Road used to connect to Georgetown Pike (called Leesburg Road on this map). Now a portion of Great Falls Road north of Route 123 is known as Lewinsville Road and a short remaining section of the former alignment is called Old Falls Road. Spring Hill Road used to terminate at Great Falls Road. A portion of Great Falls Road was abandoned south of Spring Hill Road. The section north of the former intersection with Spring Hill Road has been renamed as Spring Hill Road. Now you know why you don't want to use 80 year old maps to get to Great Falls.